With a passion for sports and years of experience, “Hometeam” Brandon Leak has become a staple in Atlanta sports media. Serving the Atlanta sports community more than a decade, Leak is recognizable with one of the most distinct voices in sports talk radio. 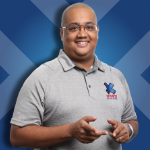 Leak is also a member of the Atlanta Hawks’ in-house media team and Hosts a Hawks basketball show – Comcast’s Hawks Talk, and is a web correspondent and contributor for Hawks.com – highlighting the NBA’s Atlanta Hawks. Additionally Leak covers the Atlanta Falcons for 680 The Fan, providing analysis and weekly interviews for listeners. Leak has also served as the hosts of Comcast’s TV show The Falcons Report. Covering everything from high-school football to professional boxing, Leak has landed interviews with some of the biggest names in sports, including: NBA Commissioner David Stern, Atlanta Falcons’ owner Arthur M. Blank, Los Angeles Lakers’ Guard Kobe Bryant and baseball’s homerun leader Barry Bonds. A hard worker, Leak has served in numerous roles his career. From intern to afternoon-drive host, producer, sideline reporter (Atlanta Hawks, Georgia Force), locker-room reporter (Atlanta Thrashers), in-game promotions (Georgia Tech Football, Georgia Tech Basketball, Georgia Force Football), and analyst (NBA TV and WXIA 11-Alive – Atlanta’s NBC affiliate). Leak’s broadcast experience has not been limited to sports, as Leak has interviewed Atlanta Mayor Shirley Franklin, legendary songstress Patti LaBelle and former Minnesota Governor Jessie Ventura to name a few. He has also served as an emcee, master of ceremonies and moderator for numerous fundraisers, banquets and social forums. With a passion for education, Leak seizes every opportunity to speak to students, providing academic encouragement and insight to those young minds with media aspirations. A native of Decatur, GA, Leak is a devoted Atlanta sports fan who lives by the motto, “if you stay ready, you do not have to get ready.” Leak continues to work hard, making a name for himself and putting his mark on his hometown. A likeable guy with a friendly disposition, Leak has definitely become a hometown favorite. Leak is a graduate of Dunwoody High School and attended Morehouse College, majoring in English with a minor in journalism. He resides in Smyrna with his wife, Trayce, and two dogs, Max and Murphy. Joseph Fitzgerald Hamilton is a former American college and professional football player who was a quarterback in three different professional leagues. He played college football for the Georgia Institute of Technology, earned All-American recognition and won several national awards. After his playing career ended, Hamilton became an administrator and coach. He has served as the running backs coach for Georgia State University and then worked in the recruiting department for his alma mater, Georgia Tech. After a storied high school career and fielding many offers, Hamilton accepted an athletic scholarship choosing to attend Georgia Tech, where he played for the Yellow Jackets football team from 1996 to 1999. He set Atlantic Coast Conference (ACC) career records for total offense (10,640 yards), touchdown passes (65) and total touchdowns (83). As a senior in 1999, he was recognized as a consensus first-team All-American, won the Davey O’ Brien Award, and was a finalist for the Heisman Trophy, finishing as the runner-up in the Heisman voting behind Wisconsin running back Ron Dayne. 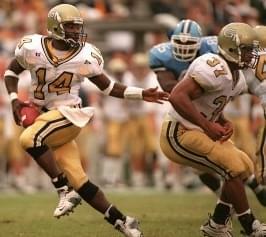 In 2002, he was named as one of the fifty members of the ACC 50th Anniversary Football Team. Hamilton was very proud to be elected to the College Football Hall of Fame 2014. 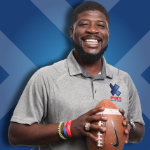 His current passion project is training and coaching young QBs through various platforms and is excited to start his broadcasting career here at Dickey Broadcasting Company and The Fan Family of Stations.